Here is my Blacet Dark Star Chaos, mounted in a custom MOTM faceplate. I've upgraded all the panel components using high quality pots, LED, pushbutton and jacks to match the MOTM component standard. I've also added a couple of extra CV inputs to control the Envelope Generator. 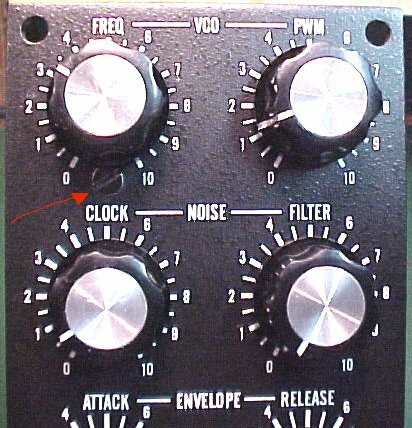 Read this page if you are interested in mounting your own third party or DIY modules behind custom MOTM faceplates. This page is here for historical purposes only - this is doing it the hard way! Now, I'd just use Larry Hendry's universal DIY mounting brackets! It takes most of the hassle out, and you avoid having to drill holes in your pretty front panel! First, obtain a blank MOTM faceplate, and have it suitably silkscreened or labelled. It must be drilled for all jacks, pots, and switches. 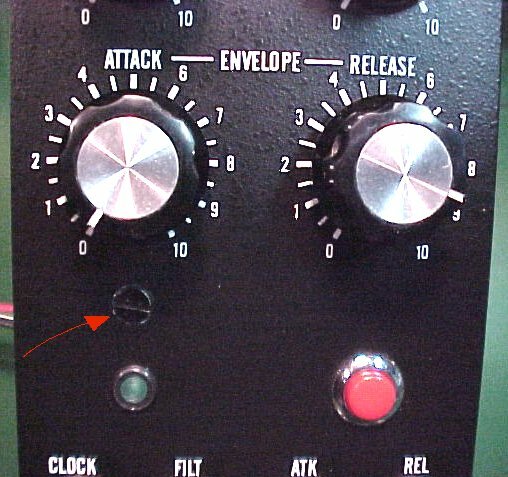 You may leave off the gate switch, use the inexpensive one Blacet supplies, or use a variety of other pushbuttons. I like the E-Switch seen in the accompanying image. Radio Shack carries a very similar switch with a black collar instead of chrome, but it doesn't "feel" as nice to push. The hole size to be drilled will depend on the pushbutton used. I also recommend replacing the generic LED supplied with one matching the MOTM standard. See my parts page for details on part numbers and suppliers. Second, decide on the pots and jacks you will use. All pots, the LED and switch will be mounted outboard of the pcb on twisted wires. I used the square blue Bourns pots with solder lugs, also used in some of the MOTM kits. If you want to use the original pots, the pot holes may need to be drilled smaller - I'm not sure since I bought my DS without any panel hardware. For the Dark Star, the actual pot value is not critical. Blacet supplies 50K ohm pots, but I used 100K with no problems. For jacks, use Switchcraft 112A - accept no substitute! 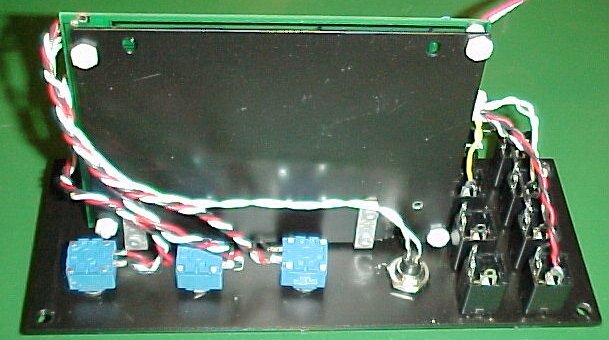 Blacet modules use clips mounted on the pot shafts to physically mount the pcb to the panel. If you're using the wider MOTM format, this technique doesn't work. I chose to fit the pcb to a MOTM L bracket. The pcb has no mounting holes, so I scrutinized it carefully, found 4 places to carefully drill holes without cutting any traces, and drilled new matching holes in the MOTM bracket. The holes at the pot end of the pcb were closer to the edge than the holes at the other end. In fact, these holes infringe slightly on a wide ground trace that runs down the "non pot" end. There is room to drill the holes and still leave plenty of trace to not compromise the circuit electrically. This is a step that must be done carefully to avoid damaging the circuit. I accept no responsibility if you screw up, burn down your house, etc etc. Since we are very close to traces and components, you MUST use nylon screws and spacers to mount the pcb, to avoid electrical contact with the L bracket. MOTM blank panels don't supply the handy built in mounting studs that come on the panels for MOTM factory modules - you must locate 2 holes on the front panel and countersink the heads to accept short flat head #6-32 machine screws. I prefer Phillips head (black colored screws are better than painting the heads, IMO. These images show flat head painted screw heads, but I have since found a source of black Phillips head screw, and have replaced them. They look much better.) To locate the panel holes, you must satisfy several conditions simultaneously. The board/bracket must clear all the pots, LEDs, jacks and switches on the back. It must mount low enough to clear the rack rail at the top, and high enough to miss the jacks. Also, the L bracket legs must be located such that when you drill through the front panel, you don't mess up any graphics. I found it impossible to satisfy all these conditions using the legs attached to the MOTM mounting plate. So I cut them off, and made a couple of aluminum angle brackets. 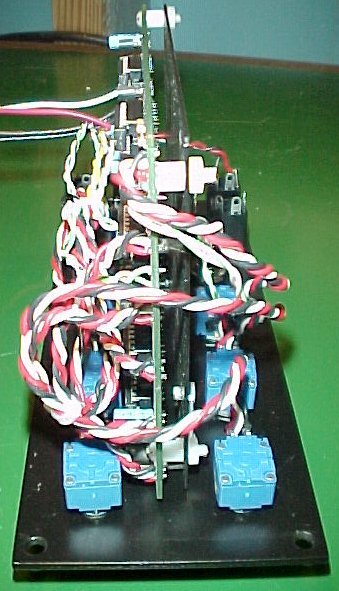 These were sized to drill in the plane of a vertical row (see mounting locations here and here), and be long enough to place the bracket and pcb squarely in the middle of the module side to side, between the rows of pots. I then located the plate in the up/down direction such that it left about 1/2" at the top to clear the rack rail. Each leg is pop riveted to the plate, and the mounting is complete! 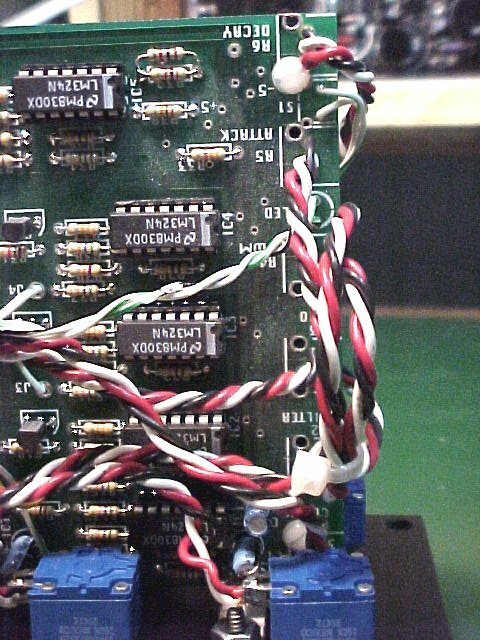 All pots and LEDs soldered directly to the pcb must be removed, and wiring harnesses soldered in their place. Using a color code helps, and twisting the wires keeps it neat. I used 22 gauge stranded wire. Make doubly sure you don't hook any pots up backwards. If you mount the board in the center as I did, some wires will have to reach around the bracket to the back. 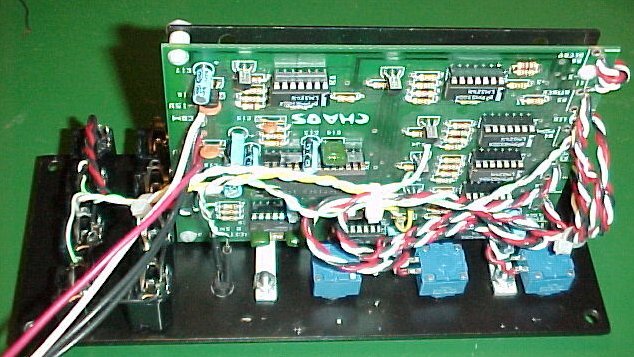 The Blacet board is not set up to directly mount a standard MTA power connector. I chose to use a standard MOTM power cable, with one end soldered directly into the board. The wire is heavier gauge than the board will take directly, so I carefully enlarged the pad holes with a fine drill (go slow or you will yank the pads off!) Alternatively, you can use the thinner wire supplied with the Blacet kit. If you use the front panel that I designed, it has 2 extra jacks not on the stock Dark Star. They are voltage control inputs for Attack and Release times. For instructions on how to do this mod, see the Dark Star circuit mods page.